If you’re planning a DIY roof repair project, there are some things you need to consider before you get started. You may be comfortable working on your own roof, however, this entails unspoken dangers which must be avoided. Roofing companies in Houston Texas like us spend so much time roofing; hence, we are steadier and automatically more comfortable. Therefore, contacting us will solve all your worries at once. Why is DIY roof repair not a good idea? You may be tempted to fix the roof all by yourself, but that could be a bad idea because your roof is a crucial part of your home. You need to make sure that the problem is fixed and is not a temporary solution. Fixing a loose shingle may seem to be a simple DIY fix. However, if it doesn’t get fixed properly, it may lead to a leak in your roofing system. This in future will cost you much more money and problems down the road than a professional fix would have. Why is professional help suggested? When professionals inspect and fix your roof, they will be able to assess its overall status. They will also be able to identify any underlying problems it may have. Because they are trained to know what is good, bad, and unacceptable. So, they will be able to guide you on the type of repair for a lasting fix of the problem. Damage to your roof can happen at any time, either through aging or as a result of weather-related damage. That’s why you should know how to spot problems before they become bigger and understand when to seek help. Therefore, you can conduct an inspection and contact roof repair professionals if you suspect any problems with your roof. If you notice signs of water damage or ceiling spots appearing on interior walls, it’s likely time to get your roof repaired. 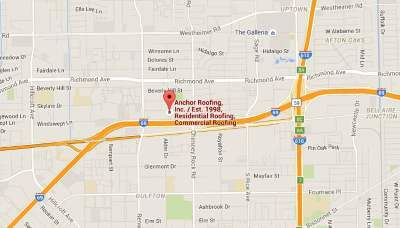 You must locate areas where damages exist and get them repaired or replaced by roof repair Houston professionals right away. Any signs of decay on the roof is a sure sign that your roof has damage due to water and may even be at the risk of a collapse. You must also check for signs of mold or algae growth which further disintegrates the roof. You must get the roof shingles repaired or replaced and treat the new material in the right way to prevent future problems. When shingles start splitting, there is a formation of gaps in the roof which further allow the debris to get reside within them. The only solution is to replace the damaged shingles as soon as possible. If you notice a water stain or leak around vents and pipes, it could be a sign that there is a larger leak in your roof that needs repair. Used for waterproofing, flashing is part of a weather resistant barrier (WRB) system of a home. When it fails, seepages can occur and cause major problems around chimneys or ceilings on your roof. Roof damage may happen due to many reasons such as storm, rain or an aging tree falling on your roof. However, hiring and working with an experienced roofer must be on your top priority in order to protect your home. Whether it happens as a result of a storm, rain or an aging tree falls on your house, working with an experienced roofer should be a top priority in order to protect your home. If a tree has fallen on your roof, remember to ask the roofing professionals to clear out all the leaves when repairing the roof. If you notice any of the above sign with your home roofing, then you must contact an expert roofing professional to fix your roof instead of trying to repair it yourself. They are the only people who are trained to determine the problems and give appropriate advice and service.